Standing at the grill in a cloud of billowing, fragrant smoke is a fine and pleasant thing on a sunny afternoon, but rain and cold can put a serious damper on your enjoyment. 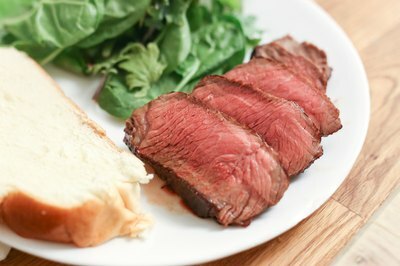 If you're craving a steak and the weather isn't suitable for grilling, turn to your oven. Tender grilling steaks are equally good when broiled or pan-roasted, and either technique produces a toothsome result comparable to grilling. Your oven can also slow-cook tough, chewy steaks to rich, meaty tenderness. 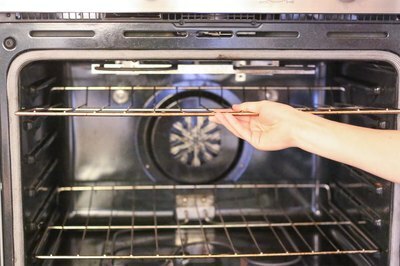 Arrange the racks in your oven so you're able to place the broiler tray near the top of the oven, approximately 3 inches from the broiler element. 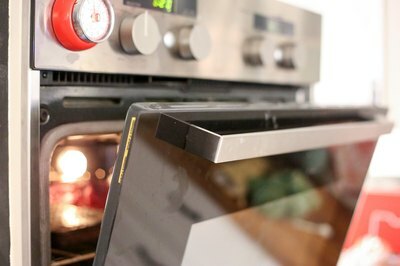 Remove the tray from your oven, close the door and turn on the broiler to preheat for at least 10 minutes. Remove your steaks from the refrigerator and pat them dry. 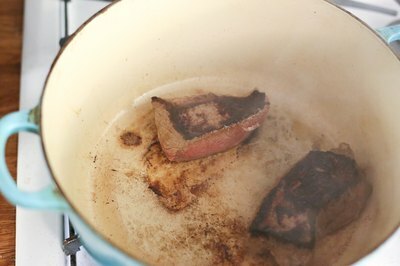 If the steaks have a rind of fat around the edge, trim most of it away to minimize splattering and smoke. Season the steaks as you like and place them on the broiler tray. 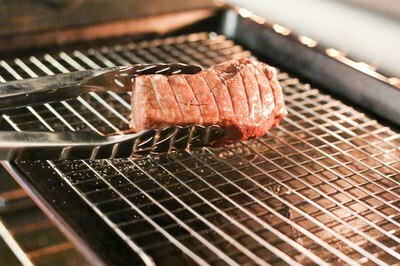 Slide the broiler tray into your oven, positioning the steaks directly beneath the broiler element. Close the oven door -- unless your stove's operating instructions specify to leave it partially open during broiling -- and make a mental note of the time. 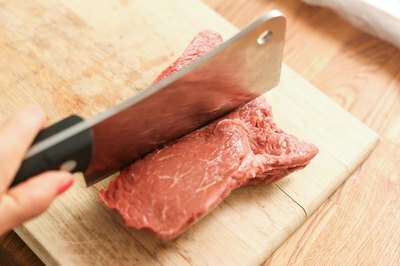 Broil inch-thick steaks for 13 to 20 minutes, depending on the cut, until they reach your desired degree of doneness. Turn them once, midway through the cooking time, so they brown and char equally on both sides. Broiling generates a significant quantity of smoke, so keep your range hood's vent fan on and open windows, if possible. 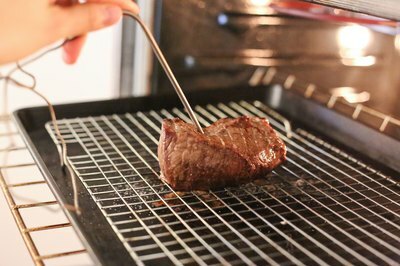 Switch off the broiler and remove your steaks from the oven when your meat thermometer shows they've reached your preferred temperature. For example, a medium-rare steak will register an internal temperature of 130 to 140 degrees Fahrenheit. Large steaks will continue to cook for a few minutes after you remove them from your oven. Preheat your oven to 375 degrees Fahrenheit. While it's heating, remove your steaks from the refrigerator. Pat them dry with clean paper towels, then season as desired. Heat a heavy oven-proof skillet over medium-high heat. 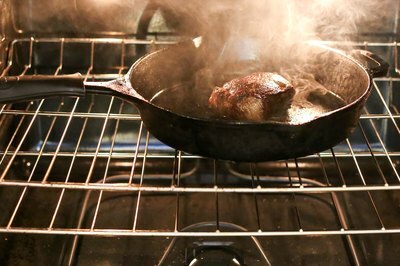 When you can see heat shimmers above the pan and catch a faint smell of hot metal, add a half-tablespoon of grapeseed, canola or other high-temperature oil and lay the steaks carefully into the pan. Sear the steaks well on each side, about two minutes per side in total, to replicate the rich, savory flavor compounds you would get from grilling. Slide the skillet into your oven, where it will finish cooking in the less-intense, diffused heat. Bring inch-thick steaks to rare or medium-rare typically in eight to 10 minutes, depending on how aggressively you've seared them. 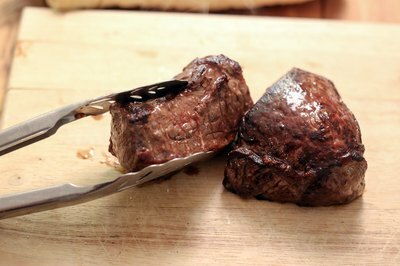 Remove your steaks from the oven when a meat thermometer or instant-read thermometer shows the have reached your desired degree of doneness. Let the steaks rest on a plate or cutting board for three to five minutes before serving. Remove your steaks from the refrigerator and blot them with clean paper towels to dry their surface and remove any fragments of bone that might remain from the butcher's saw. If they're very large -- as simmering steaks sometimes are -- cut them into individual serving portions. 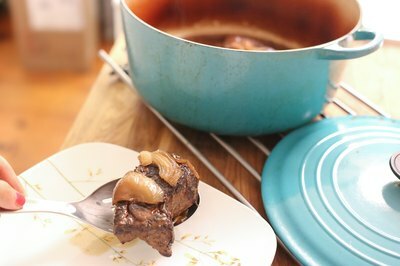 Heat a heavy-bottomed roasting pan or Dutch oven over medium-high heat on your stovetop. Working one or two pieces at a time, sear the steaks on each side. This step is optional, but it does bring the steaks' rich, beefy flavor to the forefront. Mound the steaks loosely in the pan. Add onions, garlic and other aromatics you like, and season the steaks generously with salt and pepper. Pour in enough water, broth, tomato sauce, prepared gravy or other liquid to cover the steaks. Cover the roasting pan or Dutch oven with a lid, and place it in an oven preheated to 300 F or 325 F. Slow-cook the steaks for two to four hours, depending on the cut and their thickness, until they're meltingly tender. 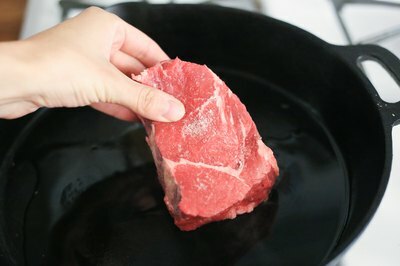 Remove the steaks from their pan with a slotted spoon, and transfer them to a serving dish. 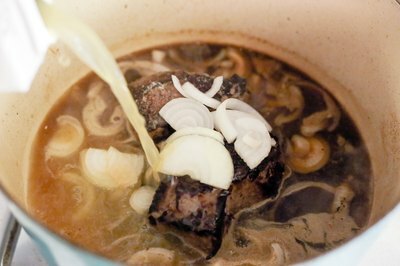 Skim any fat from the surface of the cooking liquid, and thicken it -- if necessary -- to make a sauce for the beef.